In one instrument a completely solid state battery discharge indicator, an LCD hour meter and lift lockout, housed in a 52mm case. Void of moving parts, this combination instrument is exceptionally reliable even in severe operating environments. Displays various system parameters such as battery-state-of-charge, operating hours or maintenance status from a Curtis motor speed controller or other vehicle controller. Ideal for material handling vehicles such as pallet trucks, walkies, stackers and order pickers. 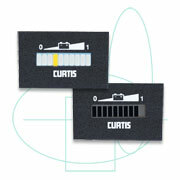 Battery "fuel" gauge is low cost and easy to install. It is a single piece package and installs via a simple 2 wire connection. For lead acid battery-powered vehicles that require a display function only. Model 906 is an inexpensive, one piece, easy to install battery fuel gauge. It is completely solid state and provides a reliable, accurate, and easy to read display of battery state-of-charge. Model 906 is available in six panel mount packages and a printed circuit board mounted module for custom dash panel applications. 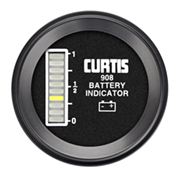 Curtis Model 908R is a completely solid state battery discharge indicator and lift lockout, housed in a 52mm case. Void of moving parts, this combination instrument is exceptionally reliable even in severe operating environments. Model 908R is a battery state-of-charge gauge ideally suited for electrically powered vehicles. 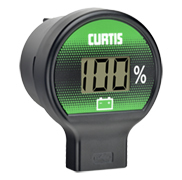 Curtis Model 909R is designed to be used on golf cars and other 36 or 48 VDC battery-powered vehicles to display battery state-of-charge and to charge smart devices. Battery "fuel" gauge and controller with lift lockout and adjustable reset and discharge settings. These proven instruments, with more than a half-million units installed, feature a rugged aluminum controller for reliable operation, even in the most severe conditions. Prolongs battery life and protects vehicle components from the effects of deep discharge in material handling and other battery powered industrial vehicles. 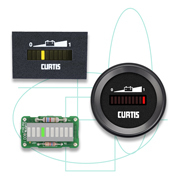 The Curtis Acuity® Battery Monitoring System is a device that mounts directly to an industrial vehicle lead acid battery. It measures, records and transmits battery performance data throughout the battery’s life. Curtis Acuity is ideal for use in electric vehicles for material handling, airport ground support, floor cleaning, light-on-road, golf/utility and aerial work platforms. The enGageI® I Voltmeter is ideal for use in a variety of battery powered applications including those associated with durable medical and material handling vehicles. 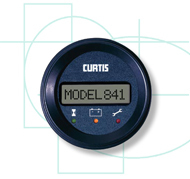 The Curtis enGage® II is a dual function, microprocessor based instrument that can be factory or user defined to monitor various functions including fuel, temperature, pressure, voltage, battery state of charge and maintenance/status. Industrial and commercial vehicles including: material handling, outdoor power and construction equipment, engine driven stationary devices, commercial cleaning equipment, golf / light-on-road and other mobility aids. Also ideally suited for monitoring scheduled maintenance, warranty and leasing intervals. Industrial and commercial vehicles, including: material handling, outdoor power and construction equipment, engine driven stationary devices, commercial cleaning equipment, and golf / light-on-road. Ideally suited for monitoring scheduled maintenance, warranty and leasing intervals.